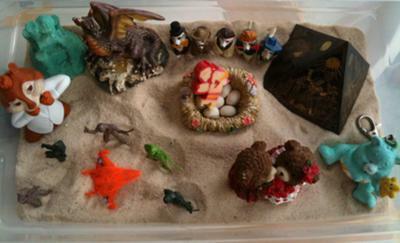 Try this Reality Therapy Activity in the sand tray for maximum results in therapy! This Reality Therapy Three Wishes technique comes from the work of Dr. William Glasser. Glasser believed that the client will identify the actual issue at hand by telling you three personalized wishes. One of the wishes will be the actual problem, or issue, the sand tray therapy client is facing. When the sand tray therapy client builds a sand tray they are actually confronting their collective unconscious themselves. Therefore, the sand tray therapy client can process through their issue with the help of the therapist and come up with goals and solutions. 1. Ask your sand tray therapy client to come up with three wishes in their life that would really make a difference if one or more of them came true. One of the wishes needs to be based in reality. Also, you can't wish for more wishes. 2. Process each of the three wish with the sand tray therapy client. What would they really gain if each wish came true and how would their life be better? Is this wish realistic? 3. Go over goal setting skills with your sand tray therapy client. What would it take to make one or more of the wishes come true in their life, and is it even possible? 4. Now, what responsibility, or actions, would they have to take to make the one true wish come true? 5. Ask the sand tray therapy client to build a sand tray based on these three wishes. There is no right or wrong way to build this sand tray. I have seen clients build a tray with three parts, or in groups of three parts. Allow your sand tray therapy client to build a tray any way they want to build it. Now process the sand tray with the sand tray therapy client. See what miniatures were placed on the reality based wish. The sand tray therapy client may want to build another tray based on the wish based in reality therapy. After the sand tray therapy client has identified the Reality Therapy's three wishes and it is clear that one of the wishes is based in reality (the issue at hand) have them make a magic wand. Put the "issue" on one side of the wand, and the goals, or solutions, on the other side of the wand.